"Hard Times Don't Hit Me No More" was written by top Louisiana Artists and the Homeless from the New Orleans Mission in one of the most unique and amazing songwriting jam session ever. A percentage of all sales will benefit the homeless. 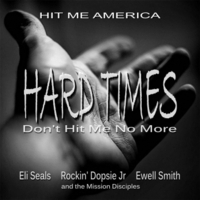 Written and created in one of the most unforgettable music experiences ever, "Hard Times Don't Hit Me No More" is a great Blues Jam that will not only rock your soul but could change the perception of the way homeless men and women are viewed in America. Top Louisiana artists teamed up with the homeless in one amazing songwriting jam session to write a hit song...and they only had one hour to do it! Never losing faith that they would succeed, this one of a kind songwriting team wrote an amazing song that's guaranteed to put a smile on your face.